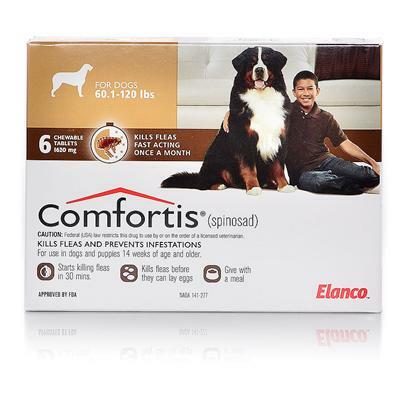 Comfortis is the first beef-flavored chewable that both kills fleas and prevents infestations in your dog or cat for a full 30 days. Comfortis is safe for puppies and kittens as young as 14 weeks. Rated 5 out of 5 by 256 reviewers. Comfortis really takes out the fleas on our Mini-poodle and we are all so happy! Worked super on my dog and my cats! relief at last--for her and me. The best flea control ever!! Great flea control. ?? on tick control? LEAVES FLEAS IN A STATE OF PANIC!!!!! THIS IS GREAT I LOVE IT !!!!!!!!!!!!!!!!!!!!!!!!!!!! Works GREAT -- no other product worked!! My dogs refuse to eat it! This is the only flea med that works for us! Works when nothing else does!! Be sure to give with food!